Can combined real time data streams digitally reveal life in a large scale urban area? Our research findings show that analysing trends across multiple data sources reveal more behavioural information than focusing on a single data source (e.g. webcams showed number of people in the park, but Wi-Fi event logs showed how long people spend at different locations). Combining temporal and spatial analysis made it possible to test assumptions (e.g. March data showed an unexpected rise in volumes that coincided with an event at the velodrome, but the spatial analysis showed it was unlikely to be related since it was in a different area of the park). It was not anticipated that the Foursquare data would prove useful due to its small volume and the majority of readings occurring for venues located within the Westfield shopping centre. However, temporal variation in ‘HereNow’ check-in volumes under different conditions closely mimicked the webcam data. Our research findings show that there is a basic signature that could be used to establish thresholds for expected versus unexpected behaviour under different conditions to create an alerting mechanism. In the past decade, the growing volume of data captured and shared from mobile and embedded devices during daily urban interactions has created a new approach to situation analysis: the use of real-time data to monitor and predict events as they unfold. However, data about real-world scenarios contains uncertainty. Sensors contain different levels of accuracy and precision, that can disrupt or distort readings. Digital devices require power and access to a communications network to record and transmit observations. A loss of either can result in missing data. 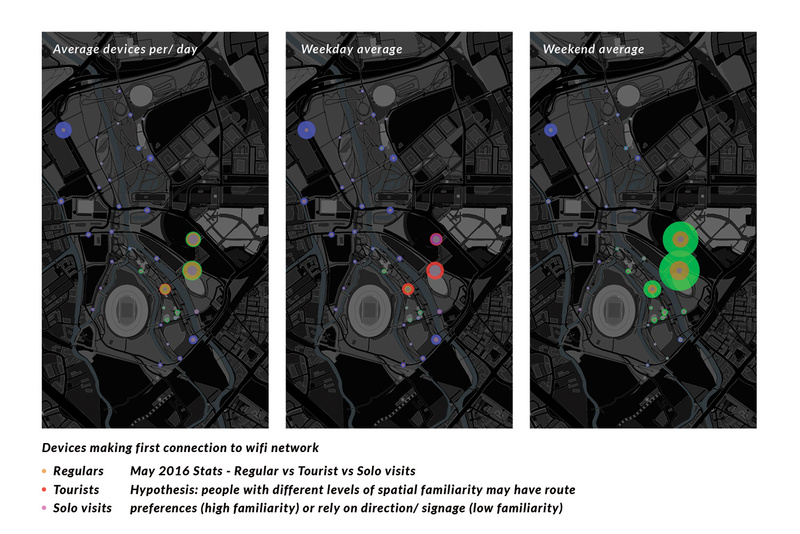 An objective for this research is to evaluate the usefulness and reliability of real-time data sources for revealing everyday human behaviours within a large-scale urban open space. The spatial scope for this analysis is the Queen Elizabeth Olympic Park (QEOP) in Stratford, East London. It is one of the largest urban parks in Europe and combines parkland with play areas, and a number of event venues. It is bordered by residential, retail, commercial, and educational structures. This research will explore the potential for analysis of real-time data to better understand life in the park. and accessible methods. Two types of data were collected and analysed: sensor readings from devices embedded within the park and unprompted social media shared publicly whilst visiting the park. The sources were webcam footage (webcams), the park’s wireless network logs (Wi-Fi), Twitter messages and Foursquare venue check-ins. Data collection took place over 2 periods: 4th to 31st March 2016 and 1st May to 31st August, during which the park hosted a multitude of events, ranging from the World Track Cycling Championships and a Sports Relief charity event to an AC/DC music concert and the West Ham football team officially moving to the London Stadium. This period was also particularly active due to the Easter bank holidays and summer school holidays. For each analysis, four questions were considered: Are there variations in behaviour for different situations occurring in the park? Can real-time data reveal contextual differences that may affect behaviour? Are the changes detected consistent across data sources? Do different data sources provide complementary information?